BROADBAND COMMUNITIES is the leading source of information on digital and broadband technologies for buildings and communities. Our editorial aims to accelerate the deployment of Fiber-To-The-Home and Fiber-To-The-Premises. 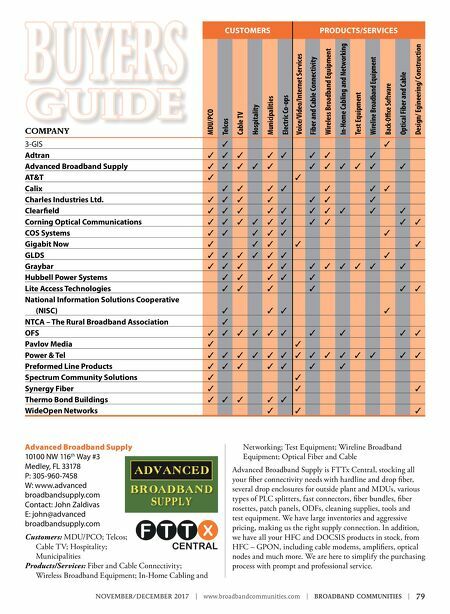 78 | BROADBAND COMMUNITIES | www.broadbandcommunities.com | NOVEMBER/DECEMBER 2017 2018 BUYERS GUIDE Buying for Ultra-Broadband Builds and Services Where to buy equipment, software and services for delivering voice, video, data and more 3-GIS 350 Market Street, Suite C Decatur, AL 35601 P: 256-560-0744 W: www.3-gis.com Contact: Terry Price E: tprice@3gis.com Customers: Telcos Products/Services: Back-Office Software ADTRAN 901 Explorer Blvd., NW Huntsville, AL 35806 P: 800-923-8726 W: www.adtran.com Contact: Ashley Schulte E: ashley.schulte@adtran.com Customers: MDU/PCO; Telcos; Cable TV; Municipalities; Electric Co-ops Products/Services: Fiber and Cable Connectivity; Wireless Broadband Equipment; Wireline Broadband Equipment ADTRAN Inc. is a leading global provider of networking and communications equipment. 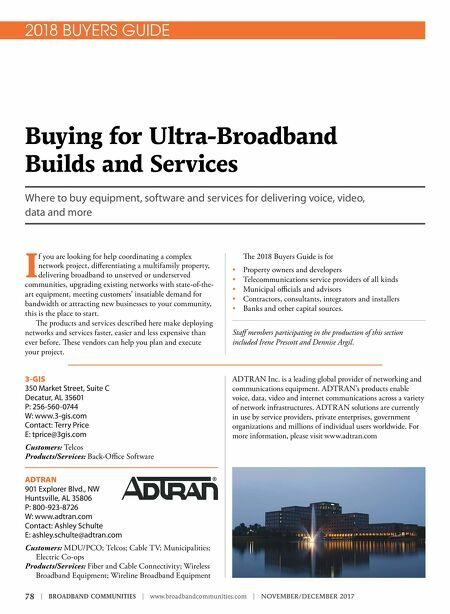 ADTRAN's products enable voice, data, video and internet communications across a variety of network infrastructures. ADTRAN solutions are currently in use by service providers, private enterprises, government organizations and millions of individual users worldwide. For more information, please visit www.adtran.com I f you are looking for help coordinating a complex network project, differentiating a multifamily property, delivering broadband to unserved or underserved communities, upgrading existing networks with state-of-the- art equipment, meeting customers' insatiable demand for bandwidth or attracting new businesses to your community, this is the place to start. e products and services described here make deploying networks and services faster, easier and less expensive than ever before. ese vendors can help you plan and execute your project. e 2018 Buyers Guide is for • Property owners and developers • Telecommunications service providers of all kinds • Municipal officials and advisors • Contractors, consultants, integrators and installers • Banks and other capital sources. Staff members participating in the production of this section included Irene Prescott and Dennise Argil. Measuring Broadband and Job Loss: Population or Income?